Revenue in the Confectionery segment amounts to US$109,952m in 2019. The market is expected to grow annually by 1.7% (CAGR 2019-2023). In global comparison, most revenue is generated in United States (US$74,844m in 2019). In relation to total population figures, per person revenues of US$145.37 are generated. The average per capita consumption stands at 21.6 kg in 2019. Confectionery defines foods with a relatively high sugar content. It represents one of the strongest sales segments in the Food market. Confectionery can be divided into four segments based on by manufacturing processes and ingredients. Chocolate and Chocolate Products, Sugar Confectionery (such as chewing gum and sweets and pastries or biscuits) and Ice Cream. This segment does not include Spreads containing cocoa and jams (see: Breakfast Products) and long-lasting products such as frozen cakes (see: baked goods). The largest manufacturers in the European confectionery market are Mars, Mondelez International, Nestlé and Ferrero. Reading Support Revenue in the Confectionery segment amounts to US$109,952m in 2019. Reading Support The Confectionery segment is expected to show a revenue growth of 2.2% in 2020. Reading Support The average revenue per person in the market for Confectionery amounts to US$145.37 in 2019. Reading Support In the market for Confectionery, volume is expected to amount to 16,616.8 mkg by 2023. Reading Support The market for Confectionery is expected to show a volume growth of 0.4% in 2020. 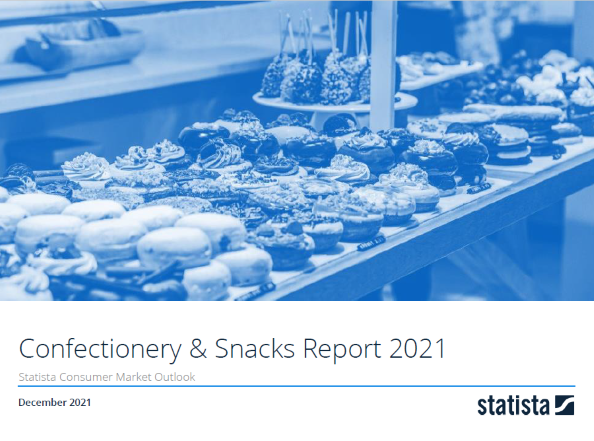 Reading Support The average volume per person in the market for Confectionery amounts to 21.6 kg in 2019. Reading Support The average price per unit in the market for Confectionery amounts to US$6.72 in 2019. Reading Support With a market volume of US$74,844m in 2019, most revenue is generated in United States. Here you can find more studies and statistics about "Confectionery".